Nissan is using the Leaf to power the creation of “reverse graffiti” in London. The company has commissioned artist Moose to selectively wash dirt off of a wall outside of a subway station, leaving behind a mural of London landmarks. 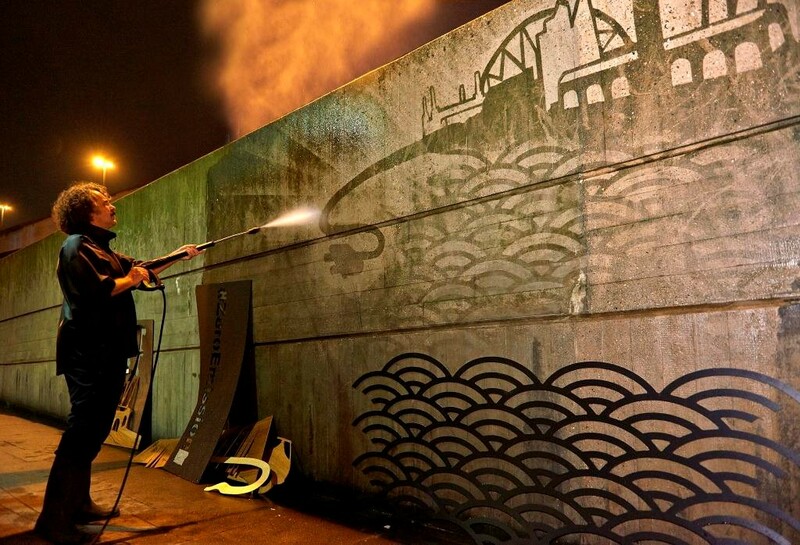 Moose used a jet washer powered by the Leaf’s battery to create the piece. The goal is to highlight the amount of pollution in London and other large cities, which is not a new idea. “It is a reminder that electric vehicles don’t have an exhaust to emit the kind of air pollution which has stained the wall Moose has created his piece on,” says Nissan’s Jean-Pierre Diernaz. Nissan has been keen to integrate its electric cars into their customer’s lives in new and interesting ways, and here’s hoping for the day when art can change the whole world. The Tesla’S D Event: D For Model D? Dual Motor? Or Driverless?